Intended UseMouse Lgals3 ELISA Kit allows for the in vitro quantitative determination of Lgals3 , concentrations in serum, Plasma , tissue homogenates and Cell culture supernates and Other biological fluids. 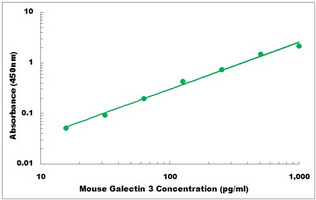 specificalSandwich ELISA for quantitative detection of Mouse Galectin 3 concentrations. Inquiry About Mouse Lgals3 ELISA Kit If you hope to order it or contact us directly, please contact us via sales@biobool.com. We will get back to you in 12hrs,Thanks!